Floodplain maps help identify where flooding is likely to occur and help us prepare for and communicate the risks of flooding. 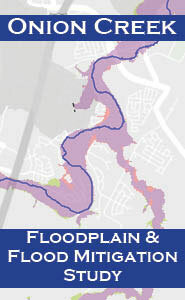 Floodplain maps are also used to regulate development and for flood insurance purposes. We periodically update our maps to reflect changing conditions and improved technology and data. To update a floodplain map for one of Austin’s creeks, we study the whole watershed draining to that creek. Such a study is called a floodplain study. It typically takes a few years from the start of the floodplain study until new floodplain maps are issued by FEMA. A study of the Onion Creek floodplain is underway. This is part of a larger, regional study called the Austin-Travis Lakes study. View the Onion Creek study web page. A study of the Lake, Rattan and South Brushy Creek floodplains is underway. This is part of a larger, regional study by the Upper Brushy Creek Water Control and Improvement District. 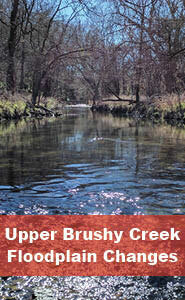 View the Upper Brushy Creek Floodplain Study web page. Before new floodplain maps become effective, there is a 90-day public appeal and comment period. Comments are intended to correct small issues such as mislabeled streets. Appeals must be based on engineering analysis. The appeal and comment period has closed for both the Onion and the South Brushy, Lake and Rattan floodplain maps. Mortgage companies usually require flood insurance for homes and businesses in the floodplain. There is a Newly Mapped Policy available for the first year when there are changes to floodplain maps. Download this FEMA document for more information: Policies for Buildings Newly Mapped into a High-Risk Area (pdf). Engineering study that includes surveying, data collection, floodplain modeling and mapping. New floodplains used for City of Austin development regulation. Submittal of the study to FEMA as a Letter of Map Revision. Initiation of a Physical Map Revision (PMR) by FEMA to update the FEMA FIRM maps. View current floodplains in an interactive map.